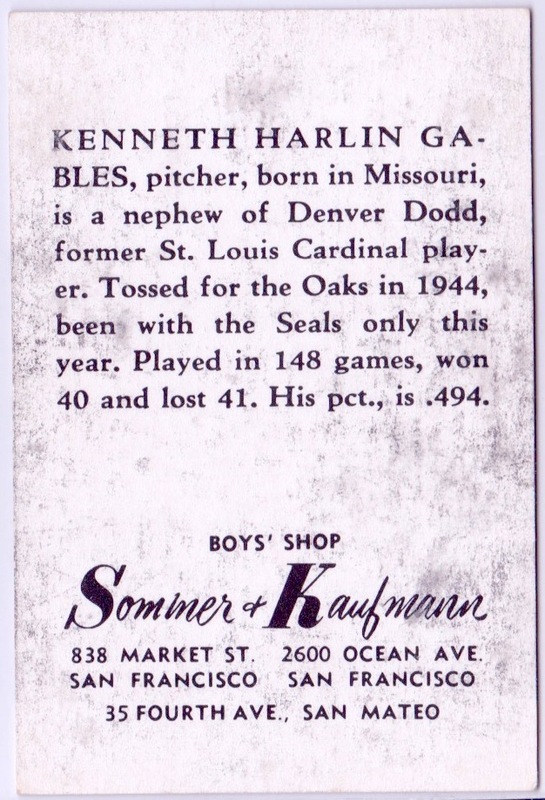 "Regional issues" remain an interesting, and often elusive, aspect of type collecting. Most often, regional sets start with a local business trying to expand in their market. They'd license some photos of the local players, print a modest number of sets, and add those baseball players to, for example, packs of lunch meat or post-purchase shopping bags. Today's set hails from the SF-based Sommer & Kaufmann boy's clothing store. We can assume stores gave away these cards or team sets with in-store purchases, or at least dangled them as freebies to encourage kids to shop there. Remar cards remain the easiest to find in today's market and Smith's not much harder. You'll grow old and die waiting for specific Sommer & Kaufmann singles to turn up, though. Be ready to spend $$$ on them when they do. Note those stats are career totals. 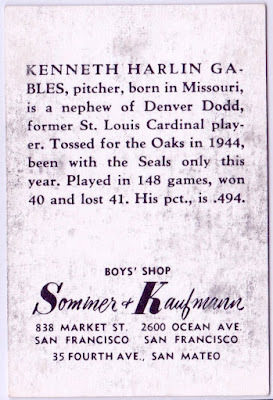 Kenneth did not pitch in 148 games with 81 decisions in just the previous season, but rather in 1942-47 combined (career stats). Going 40-41 in one year would be a scary amount of overuse. My favorite regional issue? 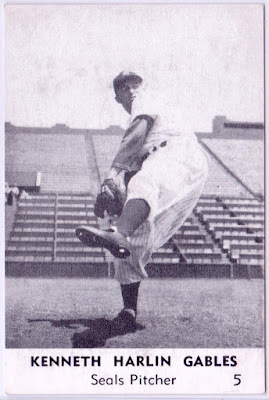 That's the 1954 Johnston's Cookies #5 of Hank Aaron (set profile), which also happen to be a Hammerin' Hank rookie card. Value: I paid $80 for this Sommer & Kaufmann #5 in 2017 and might've gone as high as $100. Don't wait on this set to "come around again" when deciding whether to buy. It's rare with ice cream on top. Fakes / reprints: Back in the 1970s, one or more complete set counterfeits entered the market. The real set's so rare, you might need a handful of them to evaluate and distinguish in person, and the counterfeits have now been around long enough to age on their own. I caution people against buying singles without good comparables. Read "The fake-card scandal of 1972" on Net54.com for more info and discussion of a range of 1970s counterfeits. 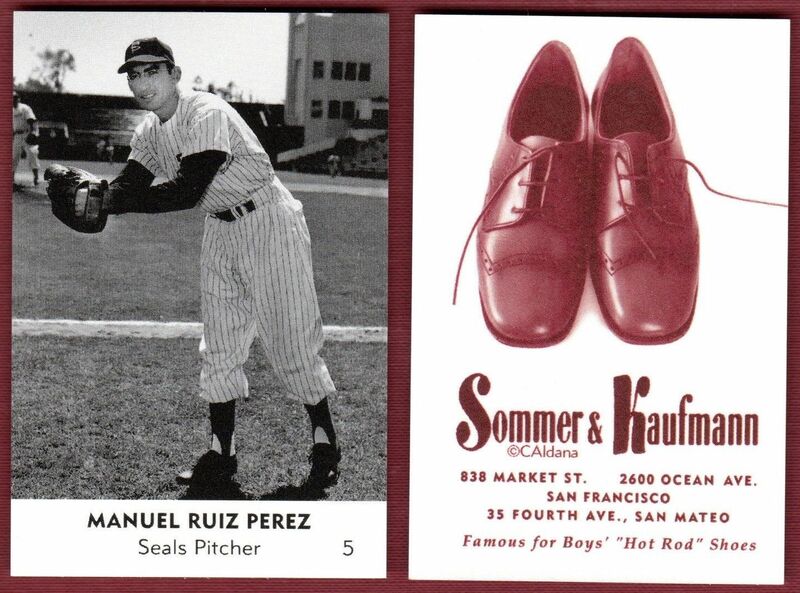 At least one modern direct-to-collectors set replicates this look-and-feel under the name "1950 Sommer & Kaufmann." There was no vintage 1950 set. Longtime collector and publisher Carl Aldana created the "1950" set in 2015 as a modern retro version, priced at a few dollars each.